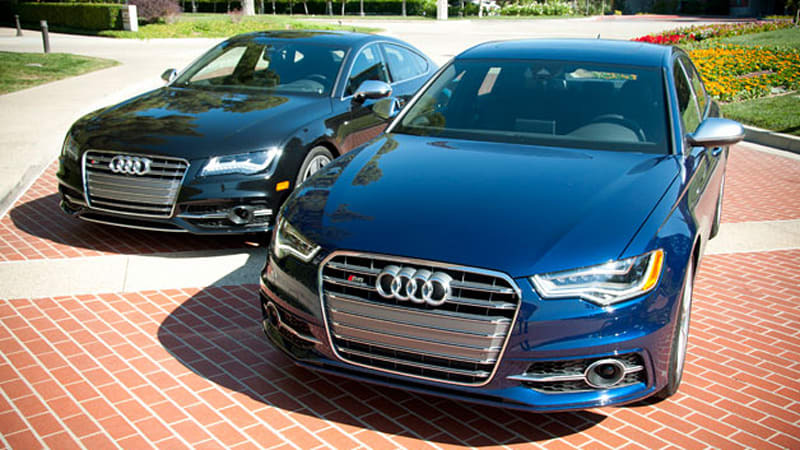 Which is best for enthusiast drivers, Audi's S6 or S7? Audi's S6 is a high-performance four-door sedan and the S7 is the automaker's high-performance five-door luxury hatchback. The two are platform-sharing siblings with common 420-horsepower twin-turbocharged 4.0-liter V8 engines, seven-speed dual-clutch automatic gearboxes and permanent all-wheel drive. No surprise, then, that straight-line performance between each is indistinguishable from one to the other. Based on this information, many casual observers are led to believe that the only discernible difference between the two models is found in bodystyle. Despite sharing the identical electromechanical servotronic speed sensitive steering, the system in the S6 delivered a more direct feel and effort felt slightly heavier. The S7 steering felt marginally lighter and less accurate. The S6 felt more balanced in the corners, even though it was the narrower and taller of the two. Mid-corner corrections were more stable in the S6, as the additional weight over the rear of the S7 caused a tiny oscillation as it corrected itself in the same maneuver. The S6 was wearing Pirelli tires, while the S7 was shod in Yokohama rubber. Audi says both tires should perform nearly identically, but we'd beg to differ. Audi's official 0-60 time is 4.5 seconds for each, but using the gearbox's (secret) launch control feature drops each to about 4.0 seconds flat. The S6 has a base price of $71,900 while the S7 starts at $78,800. Based on our short comparison, if you're not interested in the S7's form factor or trunk space, we recommend the driving enthusiast should save $6,900 and go with the S6.